Protection against slippage anytime a trailer needs to stay put. 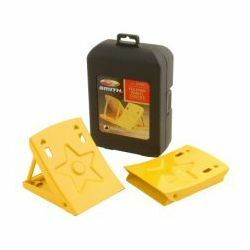 Strong heavy gauge metal chocks fold flat for transport and setup in seconds. Each Folded: 5" x 6" x 1-1/4"
Each set up: 5" x 6" x 4"